Seating Arrangement is one of the most important topic of Reasoning aptitude tests. In your reasoning exam, few questions will definitely come from this topic. Now we will show you the process of solving the Seating Arrangement reasoning questions in a very easy and quick manner. This will help in your examination to solve Seating Arrangement reasoning questions. Reasoning shortcut tricks are nothing but to solve reasoning questions very fast and accurately. Towards Left – Clockwise Rotation. Towards Right – Anticlockwise Rotation. Towards Left – Anticlockwise Rotation. Towards Right – Clockwise Rotation. In order to solve seating arrangement questions, first of all diagram should be made. By doing so questions are easily and quickly solved. 1. 6 Boys are sitting in a circle and facing towards the centre of the circle. 2. Rajeev is sitting to the right of mohan but he is not just at the left of Vijay. 3. Suresh is between Babu and Vijay. 4. Ajay is sitting to the left of Vijay. Hence, Babu is sitting to the left of Mohan. 1. Eleven students A, B, C, D, E, F, G, H, I, J and K are sitting in first line facing to the teacher. 2. D who is just to the left of F, is to the right of C at second place. 3. A is second to the right of E who is at one end. 4. 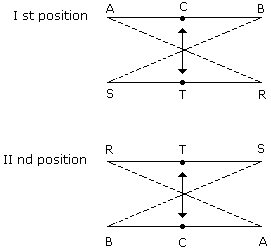 J is the nearest neighbour of A and B and is to the left of G at third place. 5. H is next to D to the right and is at the third place to the right of I. Who is just in the middle ? Hence, I is just in the middle. Siva, Sathish, Amar and Praveen are playing cards. Amar isto the right of Sathish, who is to the right of Siva. Who is to the right of Amar ? Hence Praveen is to the right of Amar. 1. A, B and C are three boys while R, S and T are three girls. They are sitting such that the boys are facing the girls. 2. A and R are diagonally opposite to each other. 3. C is not sitting at any of the ends. 4. T is left to R but opposite to C.
(A). Who is sitting opposite to B ? (B). Who is sitting diagonally opposite to B ? (A). Hence, R is sitting opposite to B. (B). Hence, S is sitting diagonally opposite to B.
LearnFrenzy provides you lots of fully solved " Seating Arrangement" Questions and Answers with explanation.